Generally for definition of elastic deformations of contacting bodies it is necessary to solve spatial problems of the theory of elasticity for a shaft and a bearing. In case of the bearing with the nonmetallic bush which module of elasticity is small in comparison with the module of elasticity of a shaft and a pad, the basic contribution to change of the form of a gap at performance of conditions (2.3) is brought by bush deformations. In this case it is possible to be limited to the decision of a problem of the theory of elasticity for the nonmetallic bush. We result here the decision of a problem for the bearing with the nonmetallic bush, which module of elasticity on two order below the module of elasticity of a steel. In Kodnira's monograph  the results of experimental researches of such bearings are resulted. 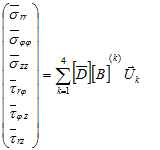 At performance of a condition (2.5) for definition of deformations of the bush it is possible to use the equation (2.6). However thus there is a complexity with the formulation of boundary conditions for the equation (2.6). These conditions, however, define bush deformations in a vicinity of its end faces. Exact definition of these deformations has important practical value as they define loading at which there is a contact of surfaces of a shaft and the bush in face sections. In this connection we result the problem decision in which bush deformations are defined by a finite element metod. We state short an essence of this method. 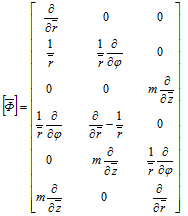 The basic equations of the theory of elasticity for the homogeneous and isotropic medium in cylindrical system of co-ordinates are resulted in. Let , are components of a vector of displacement of a point of the elastic medium with cylindrical co-ordinates . 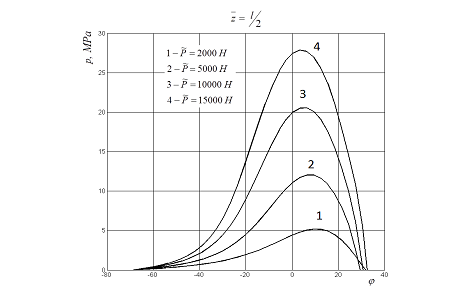 are the Poisson’s coefficient and the module of elasticity of medium accordingly. Expression (8.3) defines tetrahedron deformations through displacements of its tops. As displacements were accepted linearly dependent on co-ordinates the deformations turned out constants in all volume of a tetrahedron. Expression (8.4) defines stresses in a considered tetrahedron through displacements of its tops. As displacements were accepted linearly dependent on co-ordinates the stresses turned out constants in all volume of a tetrahedron. , are dimensional components of a vector of force which should be enclosed to tetrahedron knot. The matrix is called as a stiffness matrix of a considered finite element. Calculating such matrixes for all final elements it is possible to receive a stiffness matrix of all system of final elements with which the initial area of the decision of a problem is replaced. For this purpose it is necessary to make in each knot of a grid summation of central forces from all finite elements, one of which tops is located in the given knot. The stiffness matrix of all system allows defining central forces in any knot of a grid on the set vectors of displacements of knots of a grid. 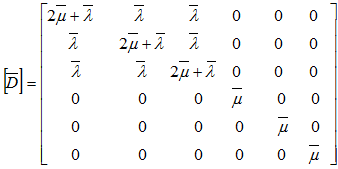 The inverse matrix allows defining a vector of displacements of any knot of a grid if the vectors of the forces enclosed to each knot of a grid are set. Matrix calculation represents the primary goal of a finite element method. If external volume forces are absent, central forces are equal to zero in internal knots of a grid. On a surface of the bush which adjoins to an internal surface of a pad, central forces are not equal to zero. They are unknown, but are known a vector of displacements of knots of a grid on this surface which are equal to zero. This condition is one of boundary statements of the problem. Other boundary conditions is equality to zero of central forces in the knots located on lateral surfaces of the bush and on a part of its internal surface on which there is no pressure from a lubricant layer. 1. We calculate a stiffness matrix of all system of finite elements into which the considered domain breaks. 2. We calculate the central forces enclosed to knots, located on a surface of considered area and equivalent to the external pressure distributed on an area surface. Where is the vector, which components are equal to displacements of all knots of a grid, is the vector, which components are equal to the total central forces enclosed to all knots of a grid. In the case under consideration these forces are equal to zero for internal knots of a grid and are equal to central forces for the knots of a grid located on a surface of considered area. 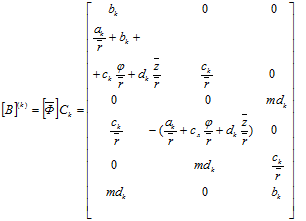 where dependence between the functions of in grid knots is defined by system of the equations (8.8), , is the curve equation on which there is a destruction of a lubricant layer. Function is unknown and is defined in the course of the problem decision. , is the dimensional load on the bearing. The calculations were spent at following values of parameters: , and the thickness of the bush . On fig. 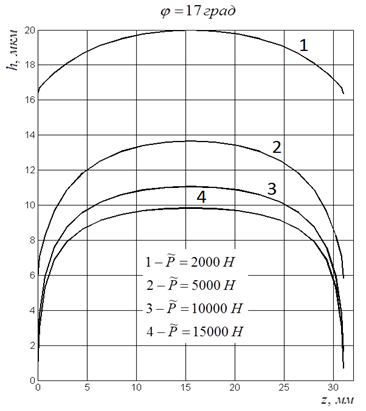 8.1 the graphs of a thickness of a lubricant layer in section , are presented at various loads. At load the distribution of a thickness of a lubricant layer is in good agreement with the experimental results in . At load the value of a thickness of a lubricant layer is above the experimental. It is connected, apparently, by that in the resulted mathematical model the warming up of a lubricant layer is not considered at its movement in a gap. In experiment the lubricant temperature on an input in a gap was supported by a constant. In calculations viscosity of lubricant was accepted by a constant in all gap and equal viscosity of lubricant on an input in a gap. In experiment the lubricant temperature increases in process of its advancement in a gap from an input to an exit from it that owing to a thickness of a lubricant layer decrease. The resulted graphs testify that with loading growth there is a zone of a gap in which the thickness of a lubricant layer changes slightly. This area extends at the further growth of loading. On fig. 8.2 the functions of distribution of pressure in section are presented. It is visible that with growth of loading the point of a maximum of pressure is displaced to the left, to a point of an input of lubricant in a gap and the pressure distribution becomes more symmetric concerning a line of action of loading and more similar to pressure distribution at dry contact of bodies. On fig. 8.3 the dependences of a thickness of a lubricant layer on the co-ordinate directed along an axis of the bearing are resulted, at value of angular co-ordinate degree. At such value of the thickness of a lubricant layer in face sections accepts the values close to the minimum values. On fig. 8.3 it is visible that at the given value the thickness of a lubricant layer accepts the minimum values in face sections. Thus at small load it poorly changes along a bearing axis. However, at high load the minimum value of a thickness of a lubricant layer in face sections can be several times less than the minimum value of a thickness of a lubricant layer in the central section (section ). So, for example, at load the minimum value of a thickness of a lubricant layer in the central section is close to 10 microns, while the minimum value of a thickness of a lubricant layer in face sections is less than 1 micron. At the further increasing in loading in face sections there is a contact of surfaces while in the central section the thickness of a lubricant layer accepts high value. 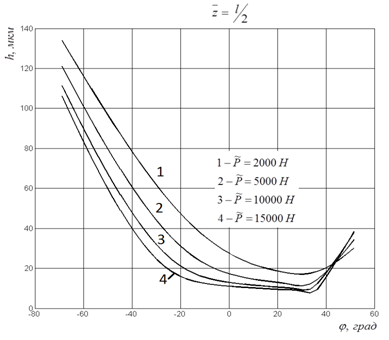 At the further increasing in load the zone of direct contact of surfaces extend, and zone, in which surface are divided by a lubricant layer, decrease. 1. Коднир Д.С. Контактная гидродинамика смазки деталей машин. М.: Машиностроение, 1976. 2 Клованич С.Ф. Метод конечных элементов в нелинейных задачах инженерной механики. Запорожье, 2009.